‘Nursery rhymes’ are mostly based on true historical events, and a lot of them are seriously fucked up. Ring Around the Rosie is my favorite. Humpty Dumpty was supposedly based on a king who died in battle after falling from his horse. One of the Richards, if I recall correctly. Really it’s asking a bit much for horses to conduct reconstructive surgery on anything, be it an egg or a man. In owing to the history behind the nursery rhyme, “king’s horses and king’s men” probably refers to cavalry and infantrymen respectively. 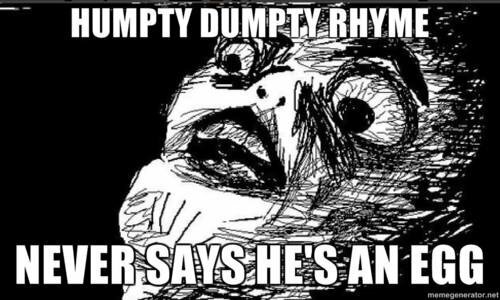 I thought the rhyme never said he was an egg because it was supposed to be a riddle. It was a riddle. It is not known whether or not it is about a person/object or if it is completely fictional.